Since moving to Ann Arbor, Michigan, in 1991, Jake Reichbart has become one of the busiest freelance guitarists in the greater Detroit area. As a sideman, the native of Goteborg, Sweden, has appeared on countless recordings and jingles and has performed alongside Motown legends and jazz greats alike, performing in more than 4,200 live gigs. His passion, though, has always been solo guitar, citing Joe Pass and Tuck Andress as his main influences, while creating a unique voice of his own. As you can see by the wide variety of standards, pop hits, and jazz classics listed in the song lesson menu at left, Reichbart can arrange for the guitar nearly any tune imaginable, drawing from any musical style. His albums 16 Songs and Long Ago and Far Away have received nominations for best jazz recording at the Detroit Music Awards and have garnered rave reviews from such prestigious publications as All Music Guide, Just Jazz Guitar, and Cadence, as well as from numerous radio stations across the U.S. and abroad. For more on Jake, visit jakereichbart.com. 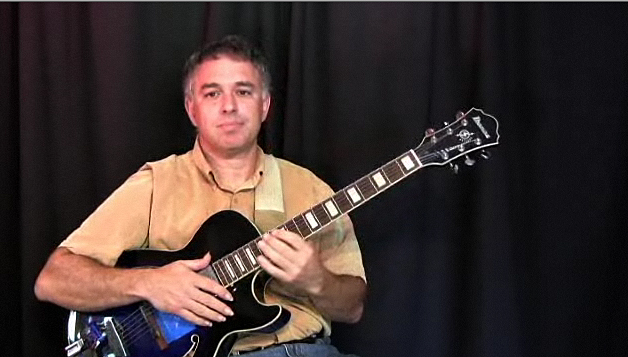 You can also check out his recent (Feb 2013) in-depth interview at JazzGuitarLife.com.